In the current world, arguments about television's ephemeral and autocratic nature do not hold. DVD technologies and digitization allow for the patience that books possess; frames can be stopped, started and reviewed at will and this allows sustained analysis. Like a book whose pages are persistent, this media is infinitely patient; the tracks of filmic texts say the same thing no matter how many times they are accessed. Further, with the archiving, clipping and sharing functionality of Web 2.0 tools (YouTube, ReelSurfer, VooZoo, Kaltura to name a few), users begin to actually "speak" with these sounds and images in unprecedented ways, producing content which was previously the exclusive province of media conglomerates who created images and sound for public consumption. When people can produce as well as consume media--when they can "write" media as well as "read" it, they can attain advanced digital literacy. Just as reading and writing constitute print literacy, reading and writing with the full range of available semiotic resources is core to digital literacy. Mander noted that human beings need "sensory cynicism" in order to distinguish between "natural" images and those which are constructed, arguing that there is "nothing in the history of the species which aids our basic senses in understanding that imagery can be altered in time, speed or sequence" (249). And yet the ability to critically analyze filmic texts, to foster that sensory cynicism is upon us. Further, given the resurgence of documentary films--consider the impact of Michael Moore, Davis Guggenheim, Errol Morris, for instance--the complex visual and aural syntax of such "texts" must be interrogated. 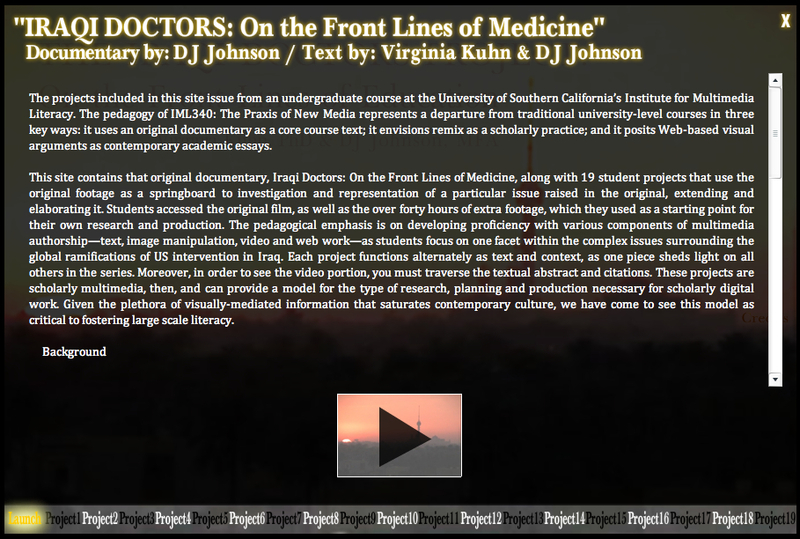 This project, "Filmic Texts and the Rise of the Fifth Estate," maps the use of documentary film as a main text in an undergraduate course, explaining its practices and elaborating its theoretical underpinnings before gesturing toward some of the more salient unresolved issues that offer avenues for further practice-based research. Discussion of "Digital Filmic Texts"
Version 4 id 8638 of this page, updated 15 June 2011 by Virginia Kuhn. Created by Virginia Kuhn.